Sending off a resume or cold calling a company can be intimidating for university students. It can be doubly so for international students with little or no work experience in Canada. To help ease some of that anxiety, Dalhousie’s Management Career Services (MCS) team launched an initiative called the Workplace Experience Program (WEP) for international undergraduate students studying Commerce in the Faculty of Management. The program runs each summer and offers participants the chance to get a glimpse of Canadian workplace culture by spending 35 hours job shadowing at a local host company or organization. “They’re spending time with people in the organization. They’re seeing what it’s like and getting a sense of corporate culture,” says Anna Cranston, director of MCS. Last month, the Canadian Association for Career Educators and Employers (CACEE) recognized the WEP program, now entering its third year, with the Excellence in Innovation for Diversity award. 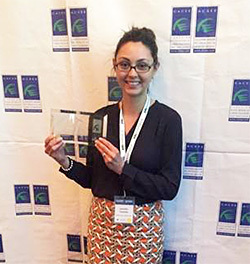 Jennifer Coombs (right), career and recruitment specialist, was present at the CACEE national conference at which the award was presented. The award honours “exceptional” programs and initiatives aimed at engaging diverse populations, developing a diverse candidate pool or enhancing retention levels among diverse populations. Students participate in the program on a volunteer basis and there is no specific requirement to complete work assignments. Instead, participants focus on making connections and developing a sense of comfort about working in Canada — and, in some cases, finding it’s not so different from back home. Miranda Ding, a recent graduate of the Commerce program from Bengbu, China, enrolled in WEP in the summer of 2014 with a placement at Clearwater Seafoods. Ding says the first-hand experience helped her decide on Marketing Logistics as a major by giving her a better understanding of the day-to-day procedures she might encounter on the job at an export-heavy company such as Clearwater, which ships lobster and other seafood to China and other countries around the globe. Intrigued by what she learned and impressed by the professional work environment at Clearwater, Ding applied for and completed a co-op term with the company last summer. Ding, who just moved to Toronto, says the WEP program gave her an excellent introduction to workplace culture at a major Canadian company. “People really like to help each other and they are a real team,” she says. Wendi Zhao, a Commerce student from Dalian, China, going into fourth year, spent time shadowing employees at Scotiabank’s Clayton Park branch last summer through a WEP placement. Zhao learned about different front-line tasks like facilitating deposits, withdrawals, and other procedures from the tellers, and was even given the chance sit in on meetings between financial advisors and their clients. She says she left the WEP feeling more confident about what it would take to be a financial advisor at a Canadian bank. Cranston says the program offers the spinoff benefit of helping to better integrate international students into the local Halifax business community, an objective in line with the One Nova Scotia Coalition’s action plan. Zhao, who has returned to Scotiabank this summer for a co-op term, says she plans to apply for permanent residency in Canada after graduation and that she’d like to stay in Halifax. There are benefits for employers as well: companies get to show that they are welcoming and want to see more international students stay in Halifax after graduation, Cranston says. A total of 20 students and 13 employers participated in the program over the first two summers, and the program looks poised for new growth this summer with 11 students and two additional hosts having signed up so far. Interested in the program? Visit the Management Career Services website for more information.